Four Color Pad Printing Combination - Guger Industries Co, Ltd.
A "Temperature Control" hot air equipment is mounted on the machine for quick ink drying and perfect registration when in process of printing. 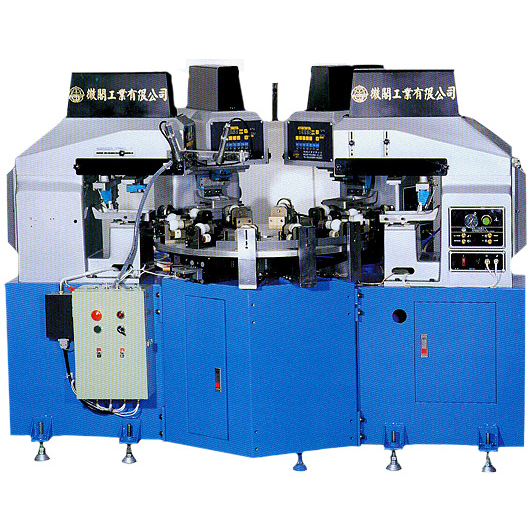 A durable Japan made non-oil type bearings and axis are used on the machine. The Mitsubishi PLC control is adopted and used as a peripheral control system to the machine of which the program can be changed to meet with users' requirements. An optional large type ratary index table is available for one side single color printing to multiple sides multiple colors printing (On request). The Combination Unit of which the model and number of machine is subject to customer's design and color required.